I’m sharing my grocery saving strategies that have saved us at least $1900 every year. Let’s get started with tip #1! I realize that true grocery stores have higher everyday prices than Walmart. But trust me, their sales are amazing. For me this is things like shredded cheese, tortillas, hot dogs, mayo, ranch dressing, Cheerios, pasta, pasta sauce, lunch meat, cream of mushroom soup, etc. Everything in your grocery store goes on sale at some point. Pick an item and watch the price change every week. At my grocery store, the price for shredded cheese will go from $3.38/bag all the way down to $1.67/bag. You better know that I’m buying cheese the week it’s $1.67! That lowest price is called the rock bottom price. It won’t ever be lower than $1.67. You don’t have to buy 37 bags of shredded cheese when they are $1.67. You just have to buy as much as you need to get you through until the next time it’s $1.67 (about six weeks). Because once you’ve paid the rock bottom price for cheese, who wants to pay $3.38? Not me! If you’re stocking up on those “need to have” items at their rock bottom price, you’re already saving 35-40% on those things you buy most often. How cool is that? Here’s my challenge to you: buy one “need to have” item that’s on sale this week. Look at the sale tag, do the math and decide if the sale price is a 35-40% reduction. Once you’ve done that for a few weeks, you’ll be on your way to a stocked pantry AND a smaller grocery bill! 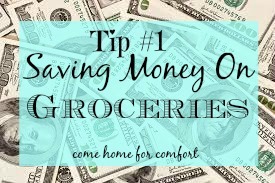 This tip works best with the rest of my strategies for saving money on groceries, so come back tomorrow for tip #2! Great post! I am going to keep track at my local grocery store and the one I like in the city. I will see if I can figure out the sale cycles. It is kind of sad that I worked in a grocery store at one time and I never realized the sales were cyclical. Oh my. Ha ha.